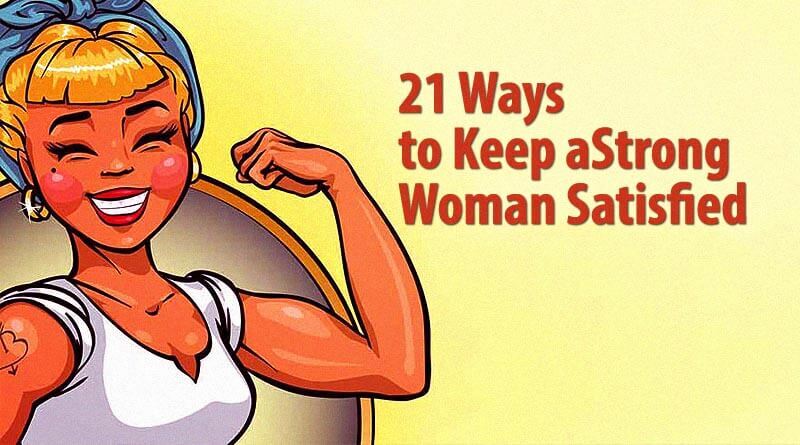 21 Ways to Keep a Strong Woman Satisfied - ShareIt! Many men are drawn to strong, empowered women. Few know what to expect once they manage to catch one. A confident and independent woman acts differently from others. She may want you, but she doesn’t need you. She respects your needs, but she won’t let her own be forgotten. She will not compromise her values, ambitions, and morals for anyone’s sake. She will not be your doormat, and she does not want you to become hers. Strong Women Terrify Men, Because They Are Not Afraid To Leave. Here’s Some Advice For Keeping The Empowered Woman In Your Life Happy. 1. Expect you will have to work for her trust. Earn it by being honest, dependable, and respectful. 2. Allow her to be vulnerable with you, but don’t demand it. 3. Show her that she can trust you to keep her deepest secrets. Make it clear that her most private thoughts, feelings, and moments will stay that way with you. 4. Don’t play games. Operate with honesty. 5. When she takes responsibility for her part in an argument, you should do the same. It is rarely a one-way street. 6. When she challenges your ideas and opinions, don’t get defensive. This is a sign that she respects you. 8. Reassure her that even if she doesn’t need you, you are always there to help her. Make it clear that you do not think any less of her when she asks for your support. 10. When she fails, praise her efforts. Help her identify what she learned and gained from the experience. 11. Help her to make a positive impact in the community. Volunteer together. Strong women love passionate men. 12. Give her spiritual practices a chance. Be honest if they do not ring true to who you are. Respect and support her in pursuing them, even if you do not share her beliefs. 14. Realize that actions speak much more loudly than words. Don’t just apologize when you are wrong. Change your behavior. 15. Share your ambitions with her. Allow her to help you reach them. 16. Ask about her career goals. Keep track of the progress she is making. Praise and recognize her hard work, no matter what the results. 17. Be clear about your expectations. Discuss the future of your relationship with honesty and transparency. Strong women appreciate straightforward men. 18. Get to know her friends and family members. 19. Don’t be offended when she asks for alone time to recharge. 20. Encourage her to care for herself. 21. Refuse to gossip about other people. This looks petty and weak to a confident woman. “Do not bring people in your life who weigh you down. And trust your instincts … good relationships feel good. They feel right. They don’t hurt. They’re not painful. That’s not just with somebody you want to marry, but it’s with the friends that you choose. It’s with the people you surround yourselves with,”explained Michelle Obama. Be A Person Who Makes Your Empowered Woman Feel Good. She Will Do The Most Incredible Things With You By Her Side.